Get in – Danger High Voltage 2 is officially named as The Final Countdown slot, and the countdown has just begun for Big Time Gaming’s much anticipated super high volatility slot to launch on March 14th! Discussed first last summer on Nickslots stream by BTG’s CEO, Nik Robinson as Danger: High Voltage 2, The Final Countdown employs a space theme alongside one of the biggest rock hits of the 80's to deliver an epic slot with unrivaled potential and that is really saying something very good indeed. 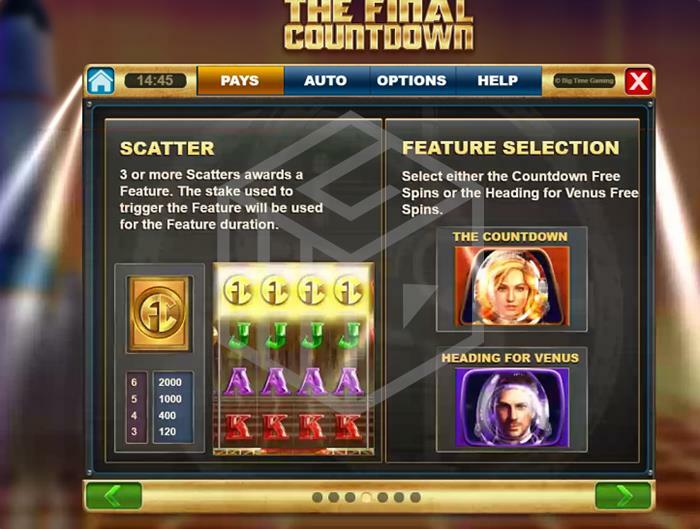 The Final Countdown slot will be available on both Relax Gaming and Scientific Games operators. Just like in Danger: High Voltage, The Final Countdown uses a 6x4 reel set with a 4,096 ways to win mechanic, offering an RTP of 96.56%-96.65%. There are also two free spin rounds of very different nature and where the biggest gains will be made. 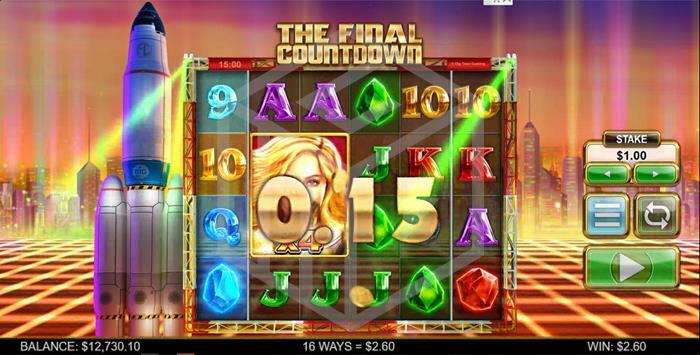 The Final Countdown slot can be played from €0.20 up to €20 per spin. The design and artwork for The Final Countdown is stunning, especially the detail on the cloning wilds. The game board is framed by a concert lighting rig with lights at either top corner panning across the screen. A BTG branded rocket, sits to the left of the board on a vast neon-patterned launchpad, while in the distance a city skyline is illuminated by laser beams and the bruised night sky. As the game’s name implies, the soundtrack is provided by Europe’s upbeat 1986 chart-topper. In normal BTG fashion, royal card values 9-A make the lowest paying symbols followed by green, blue, red, and purple gems. The purple gem is the most valuable regular symbol paying 25x the bet size for 6 across the reels. It’s worth noting, however, that the next most valuable symbol only pays 2.5x the bet size for the same win. The scatter is a gold fc (final countdown) logo, and the base game wild is a blonde lady. Wilds in the free spins round are male and female astronauts depending on which free spin round you choose. 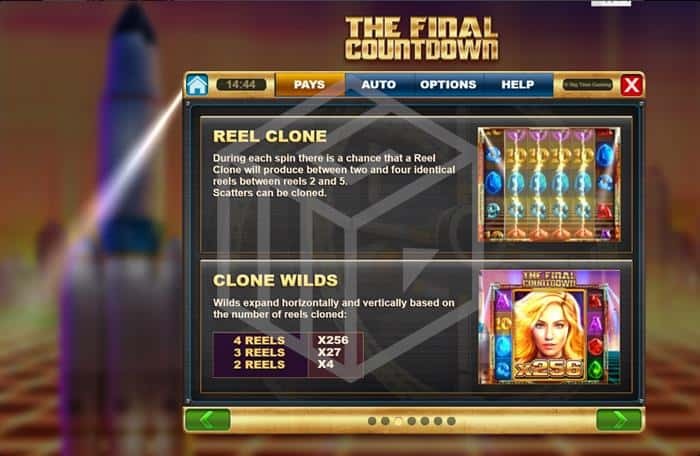 The Final Countdown benefits from a reel clone feature like the one you find in Queen of Riches and is there both in the base and bonus games. In turn, multiple cloned reels allow a cloned expanding multiplier wild in the base game. Scatters trigger the bonus round where a choice of two different free spins features are on offer. During each spin, there is a chance that a Reel Clone will produce between two and four identical reels between reels 2 and 5. All symbols can be cloned, including scatters. Any wild landing on cloned reels will expand horizontally and vertically based on the number of reels cloned. A wild on a 2 reel clone will occupy 2x2 reels hence producing a 4x multiplier wild. On 3 cloned reels it will be a 3x3x3 (27x ) multiplier wild and across 4 reels a 4x4x4x4 (256) multiplier wild. Three or more scatters trigger a feature select where you must select either 8 “The Countdown” free spins round or 15 “Heading for Venus” free spins. There are two parts two the Countdown Free Spins, the roaming wild and the countdown. A roaming 2x2 wild hovers around the board while the reels spin landing in a different position each time. The countdown, which starts at 10, is reduced by up to 3 every time you land a countdown scatter. Reach zero to re-trigger free spins. Every re-trigger will increase the size of the roaming wild up to the 256x multiplier wild. Reel clones will appear on every Heading for Venus Free Spin, and on any given spin a Velocity Wild may appear. A velocity wild will only appear on the cloned reels and grows from a 4x multiplier anywhere up to a colossal 888x multiplier. Between 2 and 4 reels may clone on any given spin between reels 2 and 5. The Final Countdown slot could well be Big Time Gaming’s biggest release of the year, and is, in our opinion, all we could’ve hoped for in “Danger: High Voltage 2”. The theme (and the theme tune) are equally engaging and help wile away the many, MANY spins you will go through in order to reach the bonus round. However, when you do the potential on offer is just astronomical. 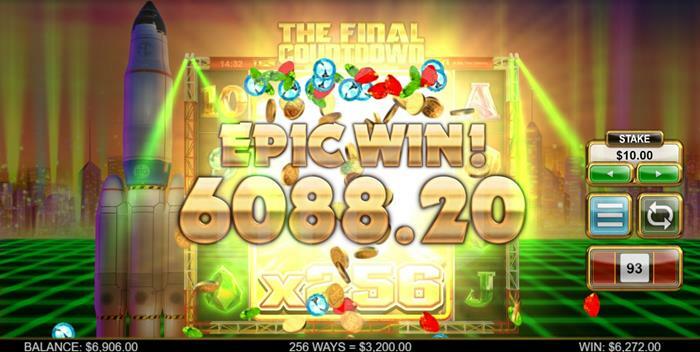 Imagine a full round of 8 Countdown Free Spins with a 4x4 wild with a 256x multiplier? Or landing even a single win with a large velocity wild with an 888x multiplier? Potential like this is extremely rare and will quite rightly get the juices flowing of any serious slotsman. A word of warning though, and is the case with many Big Time Gaming releases, this game is certainly not for the faint of heart. It is imperative you choose your stake wisely and within your bankroll. We may say this all the time but on this occasion, it is an order rather than a suggestion! If you don’t play within your means here you are going to get burned; you don’t get this type of potential without someone paying for it. But… and it’s a big but, if you get lucky in the bonus round playing The Final Countdown then you may very well be able to purchase a Space Shuttle of your own!